From 3-6 day whitewater rafting trips to 8 day backpacking trips, America's Rafting Company offers the best, most customizable rafting vacations in Idaho and Oregon. Specializing in delicious locally sourced and from-scratch food, these all-inclusive trips are the perfect phone-free getaway for families, friends, couples and business retreats. Our professionally guided Hells Canyon rafting trips and Salmon River rafting trips include fishing, camping, and mini hiking excursions. Do not miss the chance to explore Idaho's secluded backcountry with the best white water rafting adventure around. 3 Day or 4 Day Overnight Rafting Trips | WHITEWATER RAFT Hells Canyon on the Snake River – the deepest canyon in North America! On the secluded border of Idaho and Oregon, fish, swim, kayak, and hike while enjoying delicious from-scratch food in the wilderness. WHITEWATER RAFT through the many canyons of the Lower Salmon River! Enjoy 4 days and 3 nights on beautiful sandy beaches and in the pristine river. Kayak, swim, fish, play river games or just relax on your vacation. We’ll take care of all the heavy lifting, cooking and cleaning. A perfect trip for families or big groups! 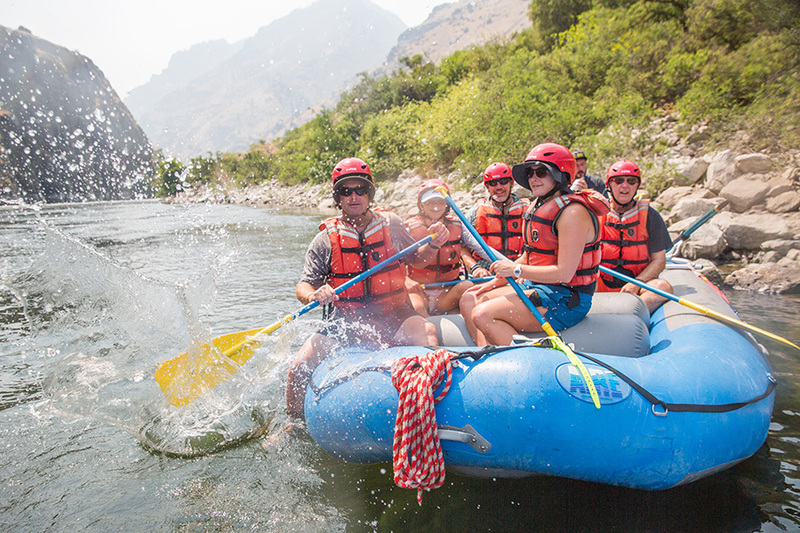 5 or 6 Day WHITEWATER RAFTING Trip | In the deepest canyon in North America, raft, hike, swim, fish, view wildlife and learn about the vast history of Hells Canyon on the border of Idaho and Oregon. Enjoy specialty drinks, from scratch riverside meals and sleeping under the stars. Join us for 5 or 6 days on the Lower Salmon. WHITEWATER RAFT, fish, swim, kayak, hike and unwind to your heart’s content. Enjoy 3-course riverside meals on white sandy beaches and sleeping under the vast Idaho sky. Great for families or big groups! WHITEWATER RAFT Oregon’s Grand Canyon for 3 or 4 days! Enjoy untouched wilderness and wildlife while floating the Oregon spring snowmelt. Learn local history and soak in riverside hot springs. A great trip for the adventurous soul! A unique HUNTING AND FISHING experience away from all the crowds. Fish for trout, bass, salmon, steelhead, and sturgeon through Hells Canyon. Hunt wild chukar through the remote, breathtaking landscape of the Snake River. Enjoy 3 or 4 days with incredible 3-course river meals and camps on the Idaho/Oregon border. An awesome adventure for outdoor enthusiasts! Hike through the Seven Devil Mountains and down into Hells Canyon where a whitewater adventure awaits. Spend nights camping alongside glacial lakes, then camp on the beaches of the Snake River. Enjoy the accomplishments of backpacking to the luxury and relaxation of a whitewater rafting river trip. Incredible Hells Canyon trip with ARC! : Wow! What an epic trip!Hells Canyon is a truly beautiful, rugged and pristine area filled with great views, fun whitewater and a ton of different animals to see. Jarrett made the trip a special one for me and my friend by helping us catch a ton of fish and also teaching us a bit about the history of the canyon. As if that wasn’t enough the homemade food and specialty cocktails provided really took this trip to the next level. I just returned from a rafting trip through Hells Canyon in Idaho with America’s Rafting Company. I will definitely go back next summer. It was both exhilarating and peaceful floating on Salmon River and camping comfortably on the shore…The food was healthy, plentiful and delicious; the tents were always set up before our arrival at night and always with views of the mountains, river and stars; we were given the opportunity to fish, jump off rocks, swim through the more mellow rapids; the only sounds were the river, birds and wind. This was the most peaceful trip I’ve taken in years. The beauty and peacefulness and good cheer were a perfect antidote to a busy summer. Without a doubt it was the most peaceful, beautiful 4 days that we have spent in our lives. The scenery is breathtaking and would you believe me if I said the food was gourmet?! Brie and fresh fruit…banana bread french toast!! Trust me, you will not forget the experience. The most relaxing vacation ever. I went on a 6 day backpacking and white water rafting trip with America’s Rafting Company last year and it was one of the most fun and memorable experiences I’ve had yet! Our guides were super friendly and knowledgeable and so easy to get along with. We were so spoiled with good food and drinks. After we got off the river, it was hard to adjust to getting back to real life. Hell’s Canyon is truly a hidden gem in the states filled with great scenery, crazy amounts of wildlife (Bears, Mt Goats, Eagles, Otters oh my!) not to mention a ton of fish to be had (my friend estimated he caught over 40 in three days).The crew at American Rafting Company really made our trip on the river a truly special experience for me and my friend…And if all of that wasn’t enough the food and drinks provided were delicious, bountiful and all homemade. Can’t recommend these guys highly enough! This Vacation has it ALL! Friends, Food, Scenery, Excitement, Relaxation and Great Guides! We went with friends on the four day Snake River trip. We had the best time! From the excitement of kayaking, to cruising in the bigger boats, to the great food and friends at night, it was a great time. Not one detail was missed by America’s Rafting Company. Their guides were well trained and filled to the brim with knowledge of the area and stories to keep you entertained. Dining (not just food) was above any expectation I could of had. I’d gladly adventure with them again. Epic and Delicious Experience! : My fiance and I went on a Snake River rafting trip with America’s Rafting Company last week and it was EPIC! We felt completely taken care of from start to finish…We weren’t sure what to expect as far as food, but Lauren’s made-from-scratch 3-course meals COMPLETELY exceeded anything we could have imagined (we had margaritas and pineapple chicken with coconut rice one night, and a cherry dessert made with cherries that she had personally picked…absolutely incredible food)…Overall, it was a high-end vacation experience in the unique and rugged Hell’s Canyon. We can’t wait to do it again! These guys completely nailed it. AMAZING and personal trip. Food was fresh and tasty! We were treated like royalty! Will recommend this company and trip to everyone!